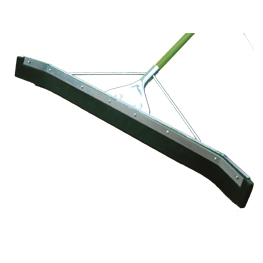 Squeegee has a 36" curved blade - Great for moving large volumes of water-even pushes snow. Reinforced electroplated steel support frame holds a flexible and non-absorbent 98% closed-cell moss rubber blade. Ideal for cleaning grout and tile crevices. Allows for faster drying time on smooth surfaces. Handle is 1" x 54" aluminum handle with 5" grip. 58" overall. Shipped knocked down for economical freight.